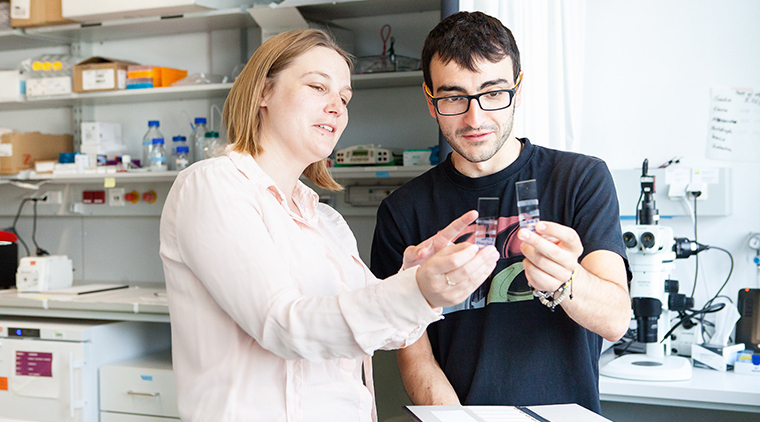 Neuroscience at IST Austria covers multiple approaches, from structural, molecular, cellular, and systems level of analysis, to computational neuroscience and the study of neurodevelopmental disorders. Understanding the function of the brain is one of the major challenges in modern life sciences. Particularly intriguing questions are how higher brain functions in brain circuits, such as encoding of information (Tkacik), learning and memory (Csicsvari), neuronal basis of innate behaviors (Jösch) and dysfunctions such as epilepsy, autism, or schizophrenia (Novarino) emerge from elementary processes, such as molecular, cellular, and synaptic components (Jonas, Shigemoto, Siegert) and their development (Hippenmeyer). In the multidisciplinary neuroscience track, we aim to examine brain function at multiple levels in both health and disease, as well as develop advanced techniques and optical tools (Danzl) for addressing these research questions. A wide variety of cutting-edge techniques such as nanophysiology, nanophotonics, electron imaging, patch-clamp recording, genetics and genomics, mosaic analysis with double markers (MADM), 4D live-imaging, optogenetics, signal processing, computational modeling, neuronal network and behavioral analysis are employed to probe the complexity of animal neuronal systems.